Save money while keeping reports looking good. Versatile report covers hold presentations, papers and reports firmly in place - documents stay protected. Clear covers come with white 1/8 inch binding bars (backbones). For 8 1/2 x 11 materials. Economy vinyl. 50/BX. Hi, I'm Griffin at C-Line, and today we're going to talk about our Report Covers with Binding Bars. 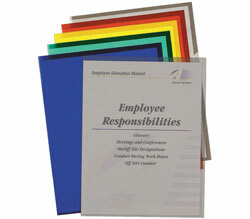 C-Line's clear, plastic report covers make your report or presentation stand out, and the white binding bars or spines hold your document firmly in place. To use, just open the one piece folded cover and place your pages inside. Because the cover is clear, the front and back sheets remain visible so you can identify your projects quickly and easily. The cover measures approximately 9" x 11⅛" to protect 8 ½" x 11" sheets. You can use the covers by themselves to hold information or separate your files, or use them with the white Slide 'N Grip binding bars. The ⅛" binding bars will comfortably hold up to 20 sheets of paper. To slide on the bars, just insert the sealed edge of your cover into the bar and slide the bar down until it is completely on. Because the bars slide on and off, it's easy to add or remove pages to a report or to open a cover if you need to photocopy the pages inside. Use C-Line report covers for presentations, reports, school projects, proposals and more. They're great for organizing your home, school, and business. Order yours now. That's all we have for today. I'm Griffin at C-Line, and thanks for watching.